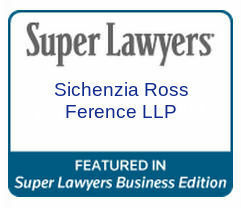 Press Release – New York, NY – May 24, 2017 – Nationally recognized securities and corporate law firm Sichenzia Ross Ference Kesner LLP recently achieved a complete dismissal of a shareholder derivative lawsuit. The shareholder plaintiff filed the derivative lawsuit in Arizona state court, asserting claims against former and current directors and officers of a company that had issued a restatement of its financial statements. The firm, on behalf of the company’s former Chief Financial Officer, moved to dismiss the complaint for failing to allege that a pre-suite demand on the company’s board of directors to institute the lawsuit would have been futile. The firm argued that, in light of the number of potentially conflicting sources and good faith but aggressive interpretations of GAAP accounting principles, a financial restatement based on an erroneous interpretation of GAAP is insufficient to establish director oversight liability. Therefore, the complaint failed to allege that the board was unable to impartially consider a pre-suite demand. The court agreed, granting the firm’s motion to dismiss in its entirety and dismissed the complaint with prejudice. Denese M. Hebert v. Nathaniel Bradley et al., Case No. : C20163440 (Ariz. Sup. Ct. May 8, 2017).